At least 27 great white sharks have been discovered swimming yards off the sandy tourist beaches of Australia’s Mid-North Coast, a video crew said Friday. The crew said it spotted the 10-feet-long juvenile sharks in the Port Stephens natural harbor as it was in a boat videotaping for a fishing DVD. The sharks, the world’s largest known predatory fish, could grow to more than 20 feet long and weigh up to 5,000 pounds. On three other days Al McGlashan and his Strikezone video crew found an average of 16 great whites a day — all between 6 feet and 10 feet long. “I’ve never heard of anywhere near this many in one area,” McGlashan told The (Sydney) Daily Telegraph. “It’s amazing. They are just babies or young sharks,” he said. It is understood Department of Primary Industries shark research division is investigating why the sharks have congregated at the spot. They were found from within metres of the long beaches in the area to several kilometres offshore. Great whites are about 1.5m long at birth so many of the sharks spotted near Port Stephens are extremely young – despite already being athletic hunters. 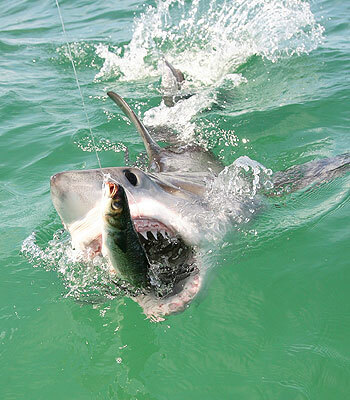 Mr McGlashan used fish on a length of line to tease the first shark they found into coming closer to his boat and he and his crew watched in awe as it exploded from the water chasing the bait. Swimmers might take solace in the fact juvenile great whites are fish eaters. What has puzzled Mr McGlashan is why they are there. “The bizarre thing is there is no food there at the moment – we saw few or no salmon which they love eating,” he said. CSIRO research has found an adult great white migration from South Australia up the east coast to Queensland.